The kitten is Little Mac, black and white, gender at this stage unknown. He (for now he is a 'he') is the latest feline to join our family. 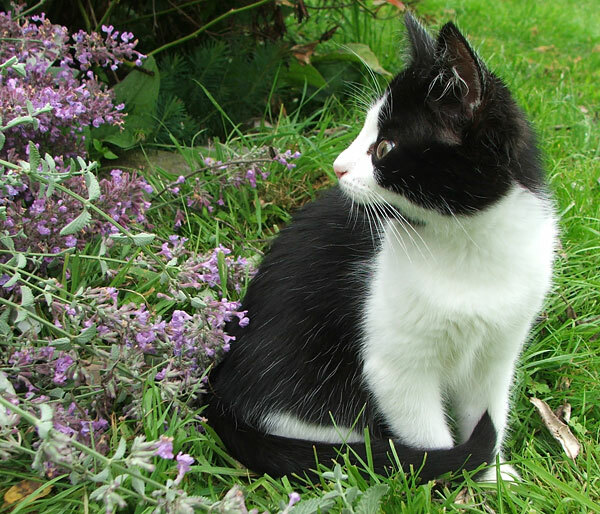 At ten weeks old Little Mac loves gardening, with all the excitement it provides for a growing kitten. The moving wheelbarrow, with pieces of tantalising greenery trailing, is perfect to chase after. The gardener planting daffodil bulbs - this game is well designed to improve a kitten's paw-eye co-ordination. What's all the fuss, having to turn the bulbs up the right way again? Pounce. Flowering cat-mint, low flying bumble bees, leaves that scamper around in the wind... The only thing Little Mac dislikes is wet paws from wet grass. He loves everything else about gardening. 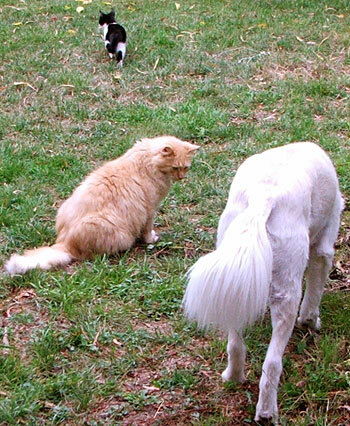 The large cat is Fluff-Fluff, the kitten's self-appointed Big Uncle and Protector Cat. As far as gardening goes he prefers a supervisory role, usually finding a comfortable spot from which to view the action. The dog is Rusty, my shaved red Border Collie with the fluffy tail. Alas, he finds gardening a bit boring (I haven't actually asked him - I can tell). But if a couple of cats are following me around, then he's far too nosy not to join us. The gardener might wander back into the house kitchen - Rusty knows that kittens get fed rather a lot during the gardening day, and gardeners make many cups of coffee. 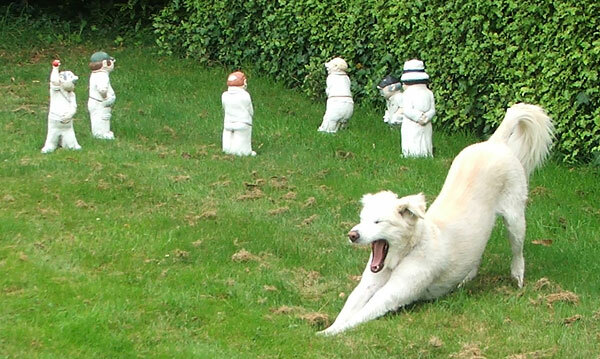 These photographs were all taken during a typical gardening session. The gardener (me) was clearing a small garden on the back lawn by the pergola, with much trimming of shrubs and removing of weeds. 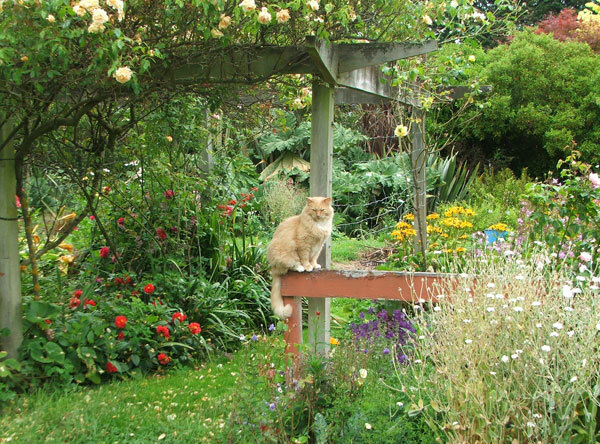 Little Mac was my paws-on helper, big Fluff-Fluff sat on his small post, an enigmatic if uncomfortable spectator, and Rusty lolled in front of the concrete cricketers. We all enjoyed ourselves - well, maybe Rusty was a bit bored. After writing this I felt very guilty. My poor dog! So I took him for a long cycle ride, compensation for his boring morning spent watching the cricket. Phew!